In New Hampshire today, Ron Paul denied that he had anything to do with the blatantly racist newsletters sent out by his organization in the 1990s, despite undeniable evidence to the contrary: Ron Paul Denies Writing Past Newsletters Featuring Racial Slurs. 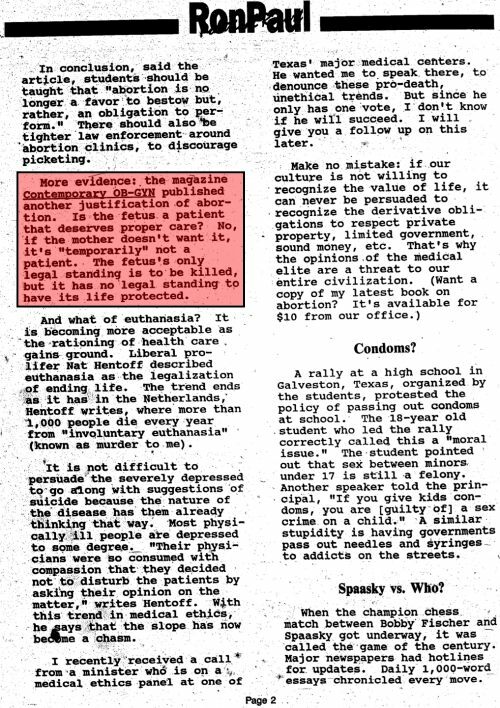 Maybe Ron Paul should explain why this 1992 edition of his newsletter cites a magazine that only a professional gynecologist (like Ron Paul) would be expected to follow: Contemporary OB-GYN. When the champion chess match between Bobby Fischer and Spassky got underway, it was called the game of the century. Major newspapers had hotlines for updates. Daily 1,000-word essays chronicled every move. Then something happened. Fischer began to lay waste to Spaasky, and the the press attention nearly disappeared. What happened? It turns out that the brilliant Fischer, who has all the makings of an American hero, is very politically incorrect on Jewish questions, for which he will never be forgiven, even though he is a Jew. Thus we are not supposed to herald him as the world’s greatest chess player. They’re lying bastards. Jews were always lying bastards throughout their history. They’re a filthy, dirty, disgusting, vile, criminal people. My main interest right now is to expose the Jews. This is a lot bigger than me. They’re not just persecuting me. This is not just my struggle, I’m not just doing this for myself… This is life and death for the world. These God-damn Jews have to be stopped. They’re a menace to the whole world. The Jews have been hardened against Christ, against decency for thousands of years… They’re gonna have to be annihilated, Eugene. Hopefully the Jews will get it in the neck soon. They have a lot of enemies all over the world. These biological weapons are getting very cheap and easy to deliver. I’m optimistic, I’m hoping that Washington DC will be wiped out. They are subhuman. They are the scum of the Earth. When you talk about Jews, you’re scraping the bottom of the barrel of humanity. I don’t think there’ll be any (world) peace until these Jews are dealt with, Eugene. These people are animals, they’re just bastards, y’know. Absolute animals.